Do you have a love of wine? Roblin Travel & Cruise > Travel Blog > Bucket List > Do you have a love of wine? Do you have a love of wine? 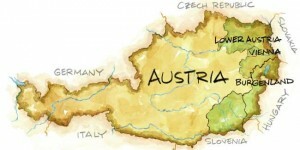 Have you ever thought of a wine vacation in Austria? Why not take a driving tour and discover Austria’s charming wine regions and local grape varieties, and why Austrian wines have become the darling of the wine world. There are 4 wine regions in Austria for you to explore: Burgenland with its lakeside vineyards, stunningly designed wineries, and Blaufränkisch reds and sweet wines. Vienna with its traditional wine taverns, trendy wine bars and, and local favorite ‘Gemischter Satz.’ Lower Austria with its idyllic terraced vineyards of the Wachau valley and typical whites such as Grüner Veltliner and Riesling. 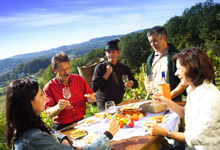 Southern Styria with its rolling hills, chic tasting rooms, and delicious Sauvignon Blanc. The majestic Klosterneuburg Abbey in Lower Austria. Located just outside of Vienna is Klosterneuburg Abbey, Splendid things happen when heaven and earth meet. Truly one of the architectural jewels of Austria, the baroque Klosterneuburg monastery has been the center of spiritual, economic, social and cultural life in the region for 900 years. 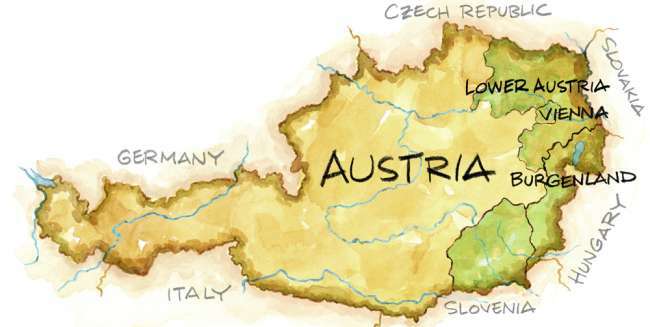 It is also Austria’s oldest and largest winery, and as the country’s first carbon neutral wine producer. On the one hour long winery tour you see how state-of-the art winemaking is seamlessly integrated in the stunning and expansive Baroque cellar. You learn the winery’s leading role in Austrian wine in the extensive old wine archive kept in the historic cellar which descends three stories and 36 meters under the earth’s surface. The famous St. Laurent wines are sourced from the world’s largest contingent vineyard of this rare and prized grape variety. If you are a wine connoisseur you have probably heard about or had a glass of wine from the Austrian manufacturer Riedel and its finest handcrafted wine glasses, which is known to bring forth the aromas of wine. Many wine professionals regard the “Riedel Sommelier” series, a top of the line mouth-blown crystal wine glass collection, as the finest in the world. Originally established in Bohemia in 1756, the company has been owned by the same family for over 250 years. Claus Riedel was the first person in the long history of the glass to design its shape according to the character of the wine. He thus is the inventor of the functional wine glass. A visit to the Riedel factory takes you on a journey through the sensory world of glass, crystal and craftsmanship. From the visitor galleries, you can watch the artistry of the glassmakers at work. Exquisite drinking glasses, perfectly shaped pitchers and elegant decanters – each piece of glass is made with utmost individual care. The multimedia show “Sinnfonie” reveals the philosophy of taste and aromas behind every Riedel glass and takes you on a sensory journey. The factory is located in the picturesque riverside town of Kufstein, in the Austrian region Tirol. At Roblin Travel we can arrange a tour of Austria that on your return home, over a glass of wine, you will telling your friends about forever!